American cockroaches are a typical problem home owners experience in Las Vegas and it is a pest issue we are highly experienced in dealing with. The best way to deal with them of course is to avoid them with the proper pre-summer and year-round treatment plants, but if they have nested in your home we can definitely remove them without a hassle to you and your family. American cockroaches are typically around an inch and a half long and a third of an inch tall. They are the same bug one pictures when they think of a common cockroach, and they are also the largest cockroach species. This pest prefers environments that are dark, damp, and cool. In fact, American cockroaches can even enter homes through plumbing due to pipes being the perfect environment for them. Basements, kitchens, and bathrooms are all desired nesting spots for these bugs once they have entered a home. When it comes to their food type and source, these bugs are omnivorous and will eat just about anything. Usually they will scavenge for “left overs” and they can survive on the most basic of starches and grease. Plates with food on them that are left in sinks are enough for these cockroaches to feed night after night. These cockroaches will also feed on readily available materials to them such as book bindings and the back of wallpaper, making them very resilient due to their abundant food availability. If you see a bug in your home which appears to be flat, has an oval shape, and slender legs, you may be catching the early signs of a cockroach infestation. American cockroaches have a red/brown color and also have wings, although they only fly when it’s 84 degrees and hotter. The females produce 100-150 cockroaches during their life, which is up to two years as it is for males. Every egg capsule a female lays contains 12 to 16 eggs which are laid indoors in damp areas. Their eggs hatch within 50-55 days. Since American cockroaches prefer a temperature that is around 84 degrees, you may find them swarming your home as it gets cooler outside during the fall. They enter homes through many ways, some of which include air ducts, pipes, small cracks, and underneath doors. Since this pest is active during the night, it can best be seen with a flashlight when it is dark. They are most likely to be found in dark and damp areas such as basements or in the grease trays of appliances. Luckily for home owners these cockroaches won’t fly in homes due to the temperature not being hot enough, so it saves them from having to search for cockroaches in high places and having to deal with flying pests during the night. At Ace Pest Control, our approach to eradicating this pest from within your home begins with a thorough inspection which lays out exactly where the cockroaches are hiding. Then a pest control plan is decided on which will not only be the most effective in removing the pests, but also keeping them out going forward. We use insecticides to treat hiding places so that cockroaches don’t nest there again, as well as special treatments for cracks and crevices which keep other cockroaches from entering the home again. 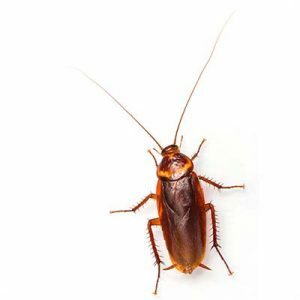 When it comes to getting rid of cockroach infestations, our team employs the use of special baits and sticky traps which not only attract the cockroaches but also dispose of them in a clean and effective manner. If you’re interested in learning more about cockroach pest control or want to set a time for a free consultation, give us a call at (702) 871-1211.